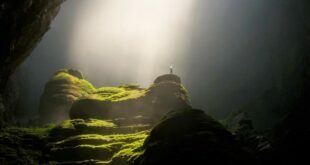 For centuries, mankind has believed that once, giants roamed our planet. There are many stories about these amazing beings who had extraordinary strength and ability. Little did they know, giants exist among us and have existed since the inception of mankind. The only difference between them and ordinary human beings is that they were extremely tall. While the average height for a person falls somewhere between 5′, 7″ and 5′, 11″, there were many in history who were close to 9′ tall. It might come as a surprise but many of these fine ladies and gentlemen were passed off as circus exhibits. 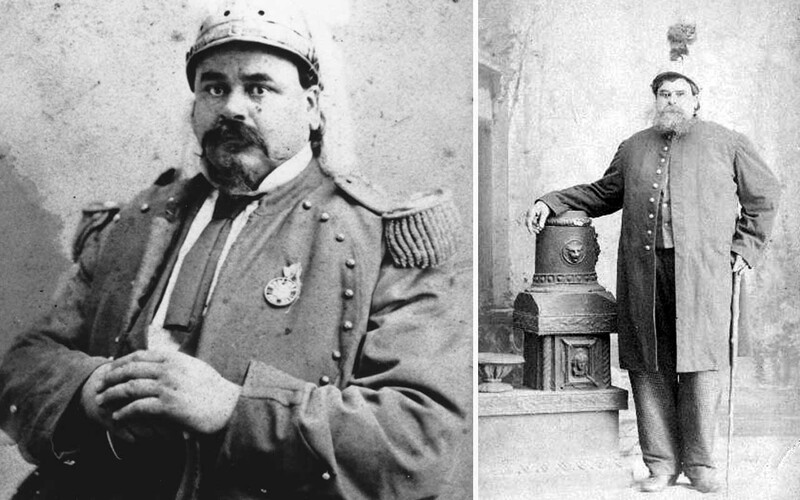 Here, we have collected 10 such stories of real-life giants from history, who roamed among us. 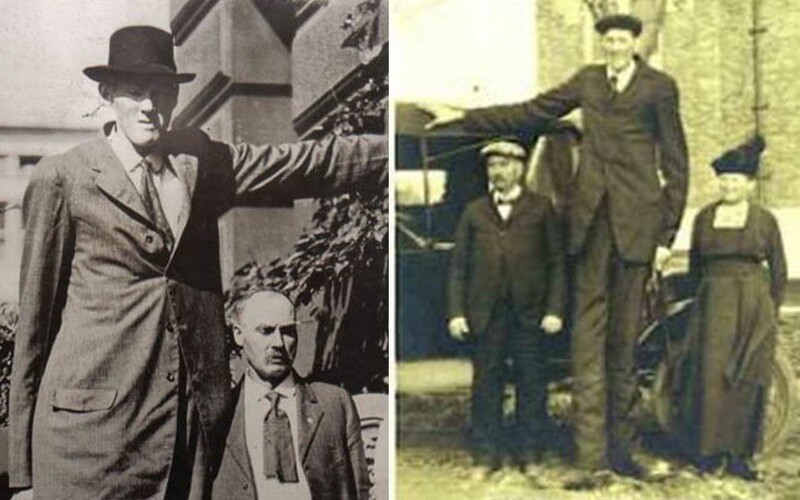 Born on July 27, 1897 in Anthon, Iowa, Bernard A. Coyne is one of only 17 individuals in medical history to have stood 8 feet tall or more. According to the Guinness Book of World Records, Coyne was rejected from serving in World War I due to his height – his draft card recorded him as 7 foot 9 inches. Coyne was born with Eunuchoidal Infantile Giantism, or Daddy Long-Legs Syndrome, which caused abnormal growth. 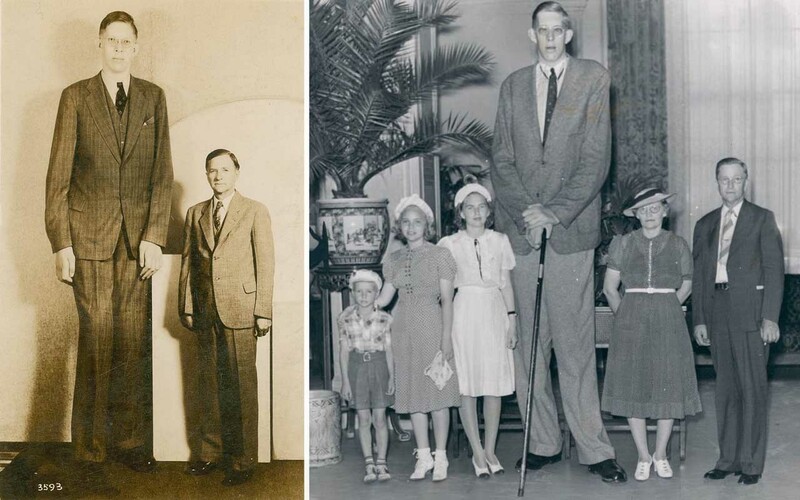 The second of six children for Mr. and Mrs. Sylvester Coyne, he grew rapidly during his youth and stood more than 7 feet tall by the time he reached his teens. Whenever Coyne went out in public, a crowd would gather around him and throughout his life, he was given various opportunities to work with big companies. However, Coyne decided to remain at his family home in Grant Township. He reportedly wore a size 25 shoe. He was capable of walking pretty well, but had great trouble playing and doing regular things. Born on June 6, 1878, at the village of Kasciuki near Viciebsk, in what is today Belarus, Feodor Machnow started growing rapidly. At the age of 14, he measured 200 centimeters (6’ 7″). His lunch consisted of 3 lbs of meat and 5 lbs of potatoes, along with other beverages. Feodor’s tallest official measurement of 7 feet, 10 inches was taken at the age of 16. During his early twenties, he met his wife, got married and had a child. By this time, his boots were so large that it reached the waist of a normal-sized human being. Some records suggest that his boots were often used as a hiding spot by youngsters during games of hide and seek. Feodor performed around the world for money. In one of the books written about him, it is said that Feodor would start the day by drinking two pints of milk and a pint of tea, and eating 16 hard-boiled eggs and six to eight small loaves of bread and butter. His lunch consisted of 3lbs of meat and 5lbs of potatoes along with other beverages. Dinner on the other hand consisted of a large bowl of soup, 3 to 5 lbs of meat, fowl, fish and vegetables, 3 lbs of bread and beverages. Anna Haining Swan was born in 1846, in Nova Scotia and was the third of 13 children born to Alexander Swan and Ann Graham. All her other siblings were of average size but Anna started growing at a fast pace. When she was 22 years old, she was 7 feet 6 inches tall and weighed 350 pounds. In 1862, the great American showman P. T. Barnum heard about the Nova Scotian giantess. He offered to bring her and her mother to New York, with a monthly pay of $1,000. Anna was to be an exhibit at the American Museum on Broadway but she was interested in education, rather than making money. P. T. Barnum however, convinced her to join him by offering to provide her with a private tutor for three hours daily for three years. Anna was pleased with this opportunity and worked with Barnum. 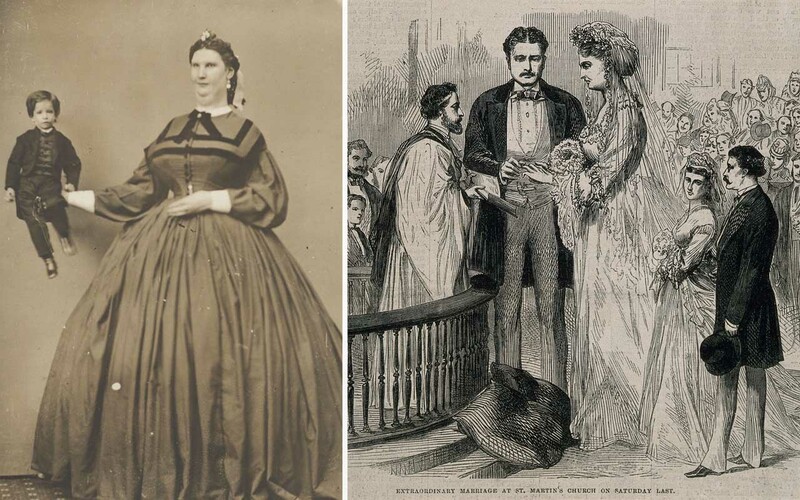 During the three years, she studied literature, voice and piano, while Barnum advertised her as the tallest girl in the world at 8 feet, 1 inch. Anna was the only giantess in the world at that time, and she attracted large crowds to whom she enjoyed talking. Arthur Caley, better known as the “Manx Giant,” was born in Sulby, Isle of Man, in 1824. He was one of twelve children. Arthur grew extremely fast and by the age of 20, he was 7 ft, 6 inches (2.28 m). His exceptional height caught attention from several newspapers, who dubbed him as a giant. 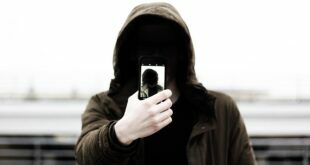 Arthur utilized the opportunity and started exhibiting himself in Liverpool, France, and Manchester. In February of 1853, Caley’s manager took a big life insurance policy on him and shortly afterwards, his mother received a letter about her son’s disappearance. 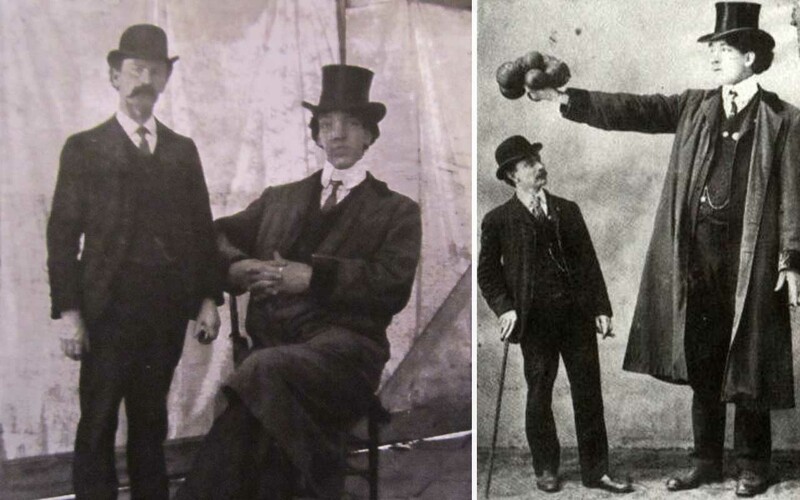 Before Andre The Giant, there was Angus MacAskill, who stood almost 8 feet tall. Born in Scotland in 1825, MacAskill was different from the rest of the giants. He was born normal and did not suffer from gigantism or an unusual amount of growth hormones. Another difference MacAskill had was enormous strength along with his enormous size. Records indicate that during his youth, he was capable of carrying two 300 pound barrels at a time, as well as lifting a 2,800 pound ship anchor to chest height. He once even lifted a full-grown horse over a four foot fence. Despite his strength, he was a gentle human being who spoke softly with a “musical” voice. Eventually, P.T. Barnum discovered him and added him as part of his shows. At the age of 24 in 1849, Barnum offered MacAskill the chance to work with him and travel the world. MacAskill took the offer and worked with him for several years, gaining fame and even getting the attention of Queen Victoria. She was so amazed by him that she invited him to perform for her at Windsor Castle. 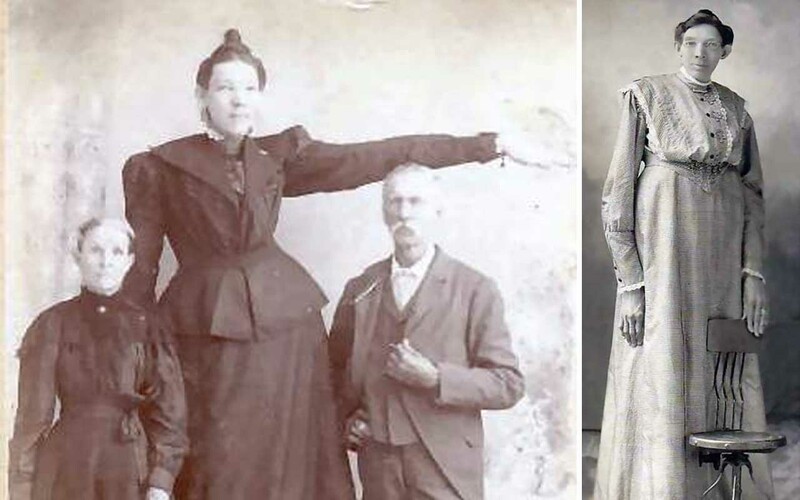 Born in Missouri in 1872, Ella was the tallest woman of her generation. 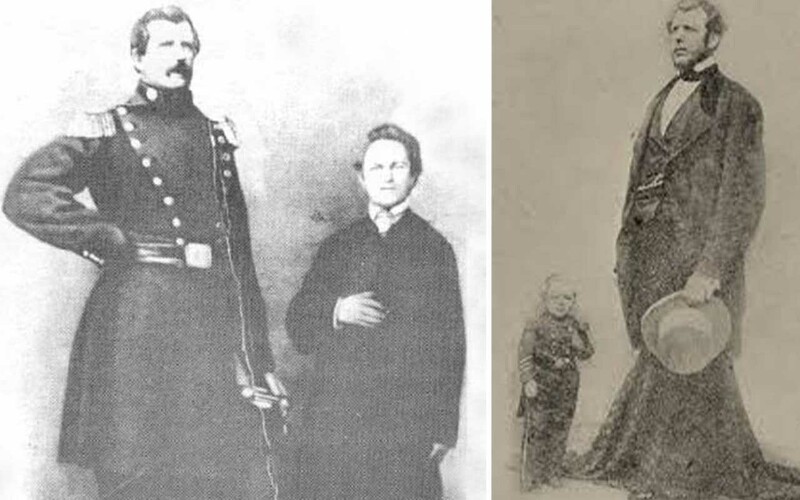 The only child of the family had an exceptional growth, which caused her to be known as the Missouri Giantess. The 8′ 4 1/2″ woman lived a short life, much of which was spent touring the country with the Barnum and Bailey Circus. During her early life, she was a normal kid but as she grew older, she started growing exceptionally fast. When word got out of the small town, people started gathering wherever Ella was present. This forced her parents, who were embarrassed by all of the attention, to shield her from the public’s eyes. 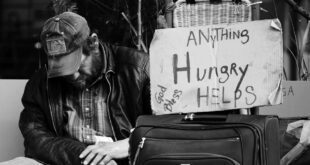 The family was poor and were struggling to survive. Although many offers were available, they wanted to stay together and rejected every offer made available to them. Finally, the offers were so large that the family decided to move around the world. The Barnum and Bailey Circus made an offer to Ella to make her the biggest act in their show. Since then, Ella stayed a sensation for 17 long years. Born on January 9, 1881, in Willow Bunch, Joseph Edouard Beaupré was the eldest son of Gaspard Beaupré and Florestine Piché. His father measured 5′ 8″ and his mother 5′ 4″. Edouard Beaupré seemed normal at every aspect but at the age of three, he started growing at an extremely fast pace. By nine, he measured 6′, at 12, 6′ 6″, and at 17, he had reached 7′ 1″ and was capable of lifting an 800 pound horse. 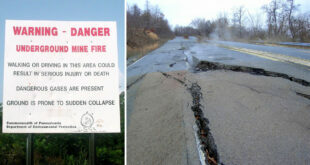 When Edouard Beaupré was 20, he lifted a 900 pound weight, which caused him to have a fractured leg. Since then, he never lifted anything past the 900 pound limit. In 1901, Edouard travelled to the United States where he worked on a ranch in Montana. He wished to become a cowboy but his dream was short lived. Someone from the circus industry managed to convince him to join them. By this time, Edouard was wearing a size 22 shoe, which had to be specially made. Many tried hard to convince Edouard to marry the tallest woman in the world, Miss Ella Ewing, but he was never interested in a married life. Born June 18, 1955, Sandra Elaine Allen is recognized by the Guinness World Records as the tallest woman in the world during her life. 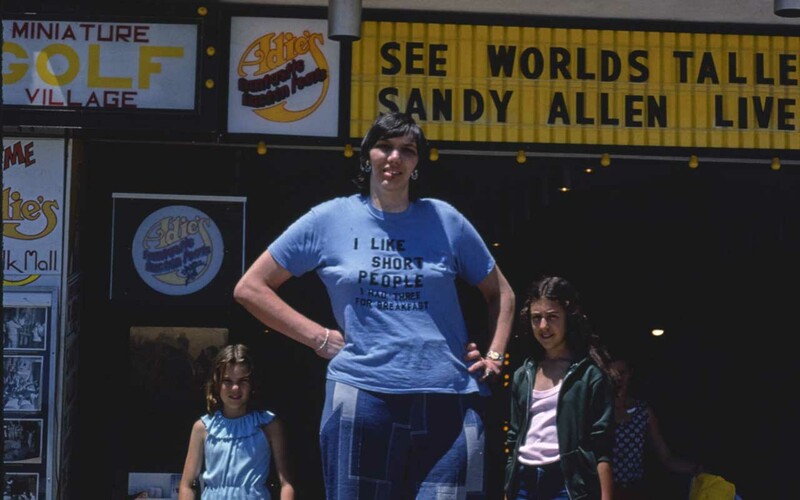 By the time Sandy was ten years old, she was more than 6 feet tall! 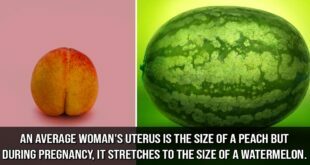 The unusual growth was caused by a tumor on her pituitary gland, that produced too much growth hormone. However, later in life, she underwent a surgery that removed the tumor and slowed her growth. For sixteen years, Allen, who was 7 feet 7 inches (231 cm) tall, held the title as the tallest woman in the world. Chang Woo Gow, most commonly known as Chang Yu Sing, was born in Fychow, China in 1845. 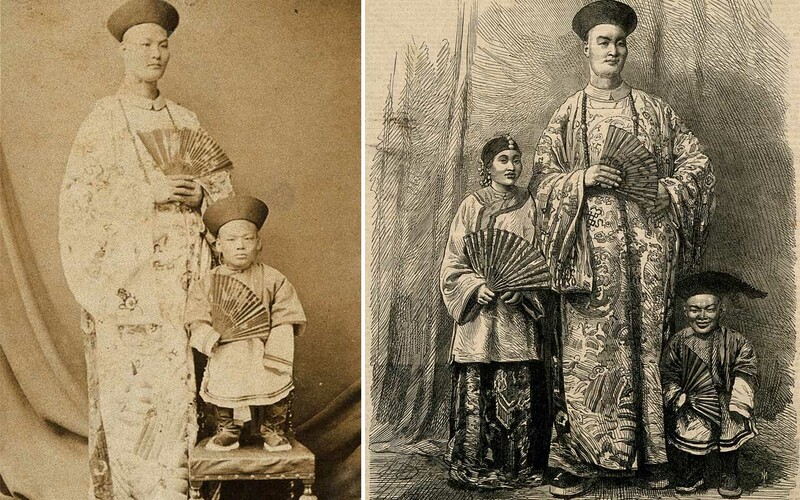 Chang grew up exceptionally fast and by the time he was an adult, he was 7’ 9″ (236 centimeters) tall. His size gathered a lot of attention, and was also the reason that he was appointed a member of the emperor’s court in 1864. Although the exact purpose is unknown, Chang left China and visited England for what was supposed to be a brief visit. The brief visited ended up lasting two years since people were amazed by his height and strength. He became such an attraction that people paid three shillings just to see him. 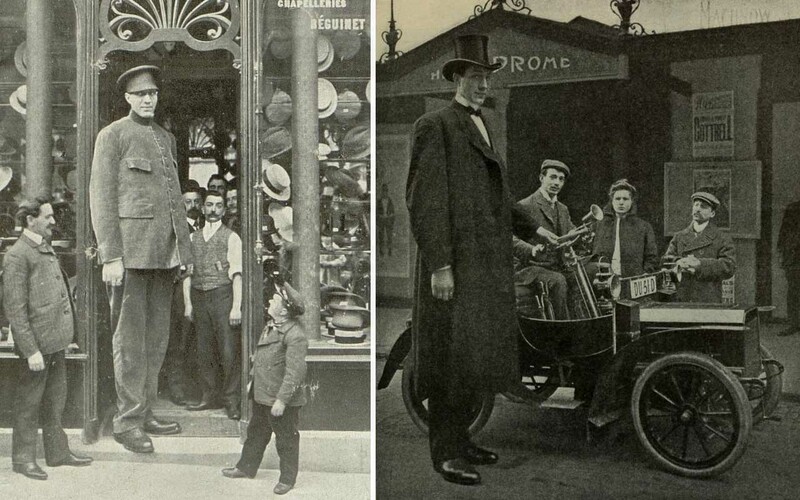 The nearly eight foot tall man started touring England with various promoters, often having his own exhibit at times. He was an intelligent man who was capable of speaking English, German and French. He also loved to read and was known to have a book around at all times. Born on February 22, 1918, Robert Wadlow was normal size at birth and was the oldest of five. When he was eight, he was taller than his father, who was 5ft, 11in tall (180.3 cm). At 13, he joined the scouts but had to have a personalized tent and uniform. He was over 8 foot tall at age 17 and in 1936, he graduated and began studying law. However, the same year, he started his career with the popular Ringling Brother Circus, which gained him worldwide fame. Although a celebrity, he was a quiet man with a calm demeanor.